We have all been faced with a choice. What book to read. Which sweater to wear. Which sport to play. Decisions can be daunting and there is no formula for making the right one or the wrong one. We have to go with our gut. 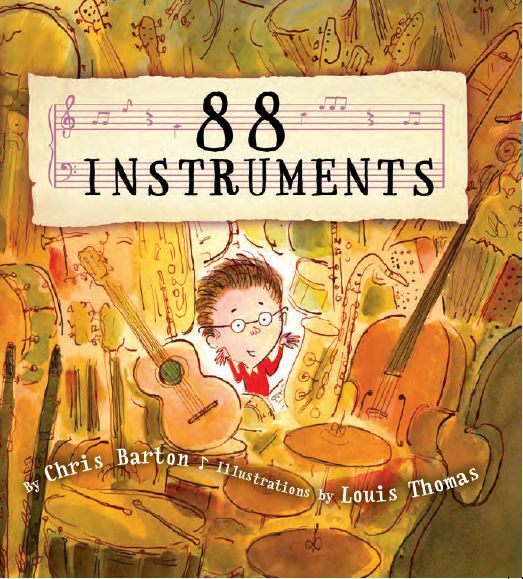 In 88 Instruments, a picture book by Chris Barton, the unnamed boy protagonist must choose one instrument to study out of 88. He goes to a music shop with his parents and tries out every instrument possible. The instruments are unnamed but are hinted at by adjectives such as squeeziest, wheeziest, strummiest and drummiest. He finally finds HIS instrument in the piano. The alchemy by which he decides that the piano is HIS instrument is unknown. He just does. This mirrors, I think, many of the decisions we make in our own lives. Why do some people find passion in music, or teaching, or painting, or doctoring, or engineering. There is no rhyme or reason. The boy discovers that learning the piano will not be easy. He has to master 88 keys in order to master playing it. He seems daunted at first, but then determined. He will learn them one by one, he decides. And he will be ready. The colors of brown and gold and red and gray remind me of the colors of instruments. 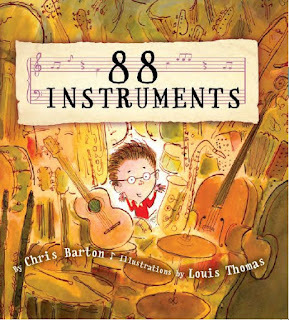 The boy’s wide eyes seem overwhelmed in the first few pages by the myriad of instruments to choose from. He seems excited and expectant when trying out each one. His parents are not pictured until he seems to hit on the right one. Parents and teachers can read this book to kids to teach them about making decisions or finding their passion. This story also teaches kids about tackling a daunting new endeavor note by note or step by step.